TaylorMade, the number one name in golf drivers, has been a leader in the golf industry since more than 30 years. After mastering the golf driver, the company has applied its award-winning driver technology to all kinds of golf clubs. TaylorMade’s Burner Plus line of clubs, the company’s improvement on the Burner line, comes highly rated and considered by some to be one of the best club sets. TaylorMade Burner Plus Irons feature the company’s best technological advances, including SuperFast Technology, Inverted Cone Technology, and perimeter weighting. These key features, combined with a large faceplate, large offset, and high launch angle, together create a set of irons good enough for the pros, but designed for amateur players. TaylorMade has improved their Burner line of clubs, which were rated highly, with the new Burner Plus line. 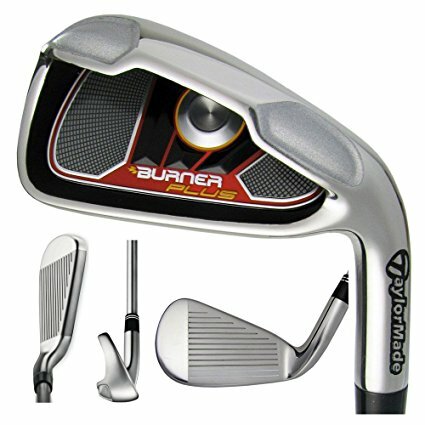 TaylorMade Burner Plus Irons are the latest in a line of clubs from a golf industry leader. Burner Plus Irons have TaylorMade’s exclusive SuperFast Technology, which uses the lightest shaft, metal material, and grips. Originally designed for TaylorMade’s drivers, Inverted Cone Technology uses a cone milled into the clubhead for a lowered center of gravity and improved consistency. A large clubface provides plenty of area for contact. A multifunctional sole with a beveled back enables a smoother launch and reduced drag. Engineers have carefully designed the club to have distributed weigh at the perimeter of the club’s head; this weight shifting creates a high moment of inertia for greater forgiveness than other models on the market. The steel-shafted Burner Plus Irons are available for men and women and are also available with graphite shafts. For some the difference in consistency was a big enough change that they had to adapt target selection; however, as one reviewer put it “is that such a terrible problem when the ball flies so true most of the time?” High handicappers, in particular, should be able to shave off some strokes with a set of these TaylorMade irons.